On an evolution of one of my favourite smoothies, I have created a new breakfast that is super easy, very healthy and can be prepared in advanced. 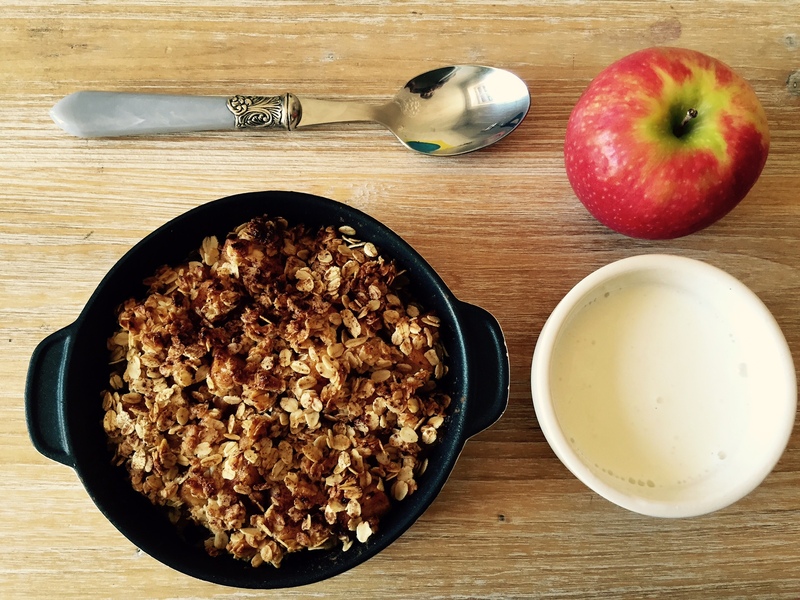 Preparing breakfast in advance is the best way to control your diet and start the day how it should, with a protein rich breakfast, high in fibre to keep you fuller for longer. It is not difficult, and you can change the flavour rather easily. Last week I posted a chocolate one, today a Vanilla Matcha one and I will keep posting variations and different recipes you can use to get your diet under control. In a blender, mix the milk, the protein and the matcha until it is smooth. 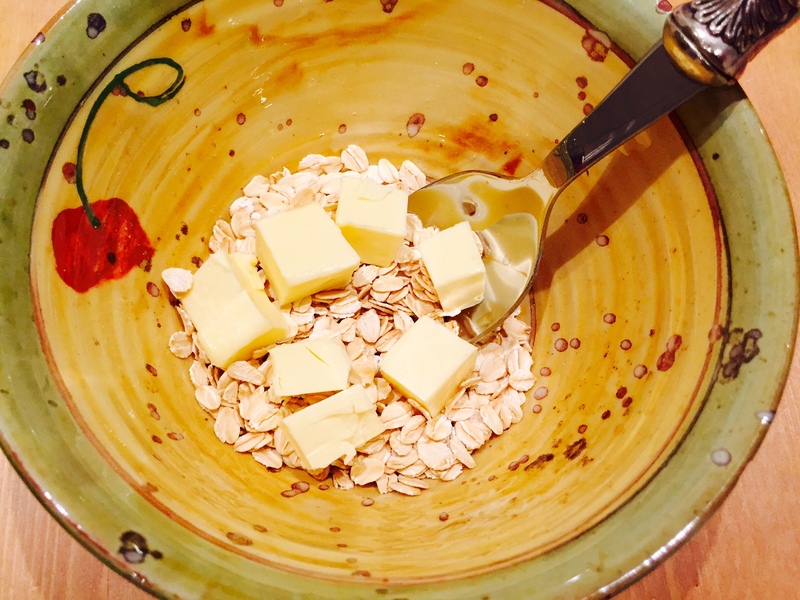 When mixed, heat up and add the oat bran, when is hot, turn it off and distribute in ramekin dishes or any container for the fridge. Serve with a small array of fruit to decorate. This provides 17 gr. of Carbs, 5 Fat, 15 gr Protein and 195 calories. Spanish traditional cooking is one of the healthiest in the world, it belongs together with the Italian and Greek traditional cuisines to the Mediterranean diet which has been acclaimed as of the best balanced in the world, together with the Japanese. Even though both contain fair amounts of fats they are mainly monounsaturated, the Mediterranean diet with a predominance of olive oil and the Japanese cuisine with an enormous amount of fish (specially fatty fish) in it, which protects the brain and the arteries. Another commonality between the two of them is the high amount of low fat high fibre carbohydrates that they consume, traditionally wholegrain rice and wholemeal bread respectively. Nowadays both have moved on to refined carbs, white rice and white breads, which comes with a reduction in the amount of fibre, and the respective weight gain in the population. This is also related to the younger generations buying into the burger & chips culture imported from less healthy diets like the Anglo-Saxon one. 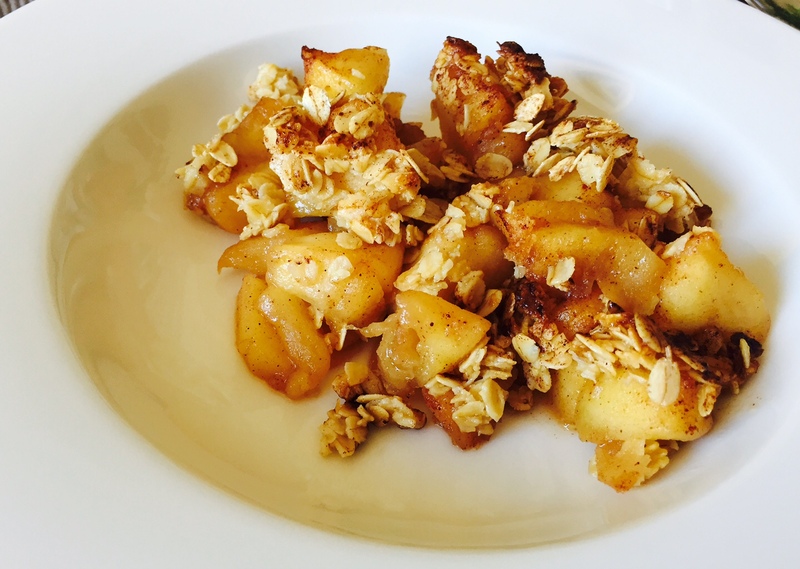 In any case, it is always a good idea to revise the classics in order to rescue and reuse the best bits that we might have forgotten on the way, and today I would like to share with you a delicious recipe that I have rescued from my childhood and updated to make it lower fat and higher in protein. Since I don’t seem to have a better name for it, there you go, Pisto! 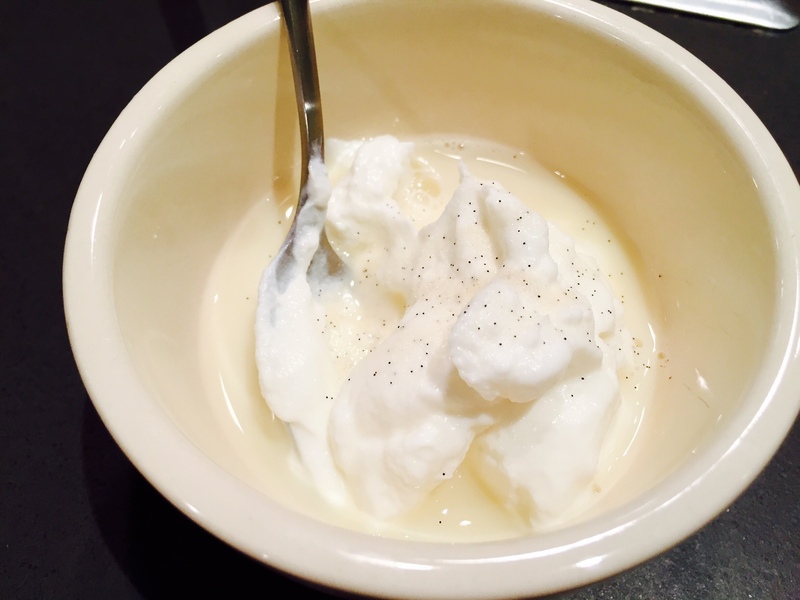 It’s a super easy recipe, really quick that also can be preserved in pots if you know how to do it and just open one and heat up for a super quick and healthy turn around. Since it is really low in calories and fat, it is ideal for a light dinner or as a starter for a two course lunch. In a medium to large sauce pan, heat up ½ a tbsp. of extra virgin olive oil and add the onions, roughly chopped, add some salt to make them “sweat” and dry a bit, once they have turned transparent, add the pepper and the garlic and let them cook for another 5 minutes. Add the chopped courgette/zuchinni, no need to peel it, as long as you wash it well. Let them cook for another couple of minutes and add the tomatoes. Mash the tomatoes with a wooden spoon and add the spices to taste. The sweetener is to reduce the acidity of the tomato and it makes a huge difference in the taste. Let the vegetables reduce for another 5 minutes. Pre heat the oven until 175C and fill two oven proof dishes with the vegetables. Crack an egg on top of each one of them and cook them for 5 to 10 minutes in the oven, don’t worry if they are not completely cooked, once you mix it, the heat from the vegetables will finish the job. To give it an extra touch of glam, you truffle it up like I did yesterday. When the eggs are cooked, take out from the oven and sprinkle with truffle, Maldon salt and olive oil infused with truffle (they sell it already like that) 1 tsp is enough. And voila! Ready to serve!! This will serve you around 210 calories of pure vegetables and protein with some good fats, perfect to go to bed well fed and without that feeling of bloating. One of the most important barriers when taking control of one’s diet, is the excuses to one self that come from absolutely rightful issues. My favourite of all times is the lack of time one. Lack of time is actually a fallacy, we all have 24h in the day, the only difference is how do we make our use of them, which is generally according to our priorities. When you have kids, the time seems to disappear between your fingers and the things that suffer the most are generally your own wellbeing and more and more in our society, the home cooking. There is simply no time for it. This is a mistake because our children are learning what we are teaching them as parents, if we do not cook at home and we don’t take care of our diets, they will learn the same patterns and they will grow up to be individuals with really bad habits. Today I want to share a recipe that will allow you to both, home cook and teach your children some good nutrition basics, and also will enable you to get easy access to a healthy lunches during the week, even if you don’t have kids, this is the foundation of food prepping. It is as simple as cooking extra. Are 2 at home? 4?? Then cook twice as much and simply pack away the extra portions in neat Tupperware in the fridge. On Sunday I generally cook my lunch and breakfast for Monday to Thursday and on Thursday eve, I cook extra and make another portion for Friday. Today’s super easy recipe is a Lean Sunday Roast. The particularities of this roast versus the one served at the pub is that this one doesn’t contain simple carbs, so we will not have the traditional gravy, but a lower fat and carb alternative, and we will also be skipping the potatoes in favour of some celeriac root. With regards to the Yorkshire pudding, I skip them altogether, but you can bake your own using wholegrain spelt flour, however, if you have enough veggies and roast, you won’t actually need it, it will just make your digestion heavier and you will end up feeling bloated! Pre heat the oven at 180C and in a big oven tray, set all the chopped vegetables. Chop them in medium chunks trying to end up with similar size pieces so they cook evenly. Season with salt, pepper and rosemary and sprinkle with a bit of olive oil and some water. Rub the piece of meat with olive oil and season with salt and pepper, set in a tray or directly on top of the vegetables and roast for about 45 minutes depending on the size of the piece. Bear in mind that all the juices of the vegetables and the meat will be in the tray so you can recover them from the parchment. In order to make the gravy, take a piece of the roasted courgette and a piece of the celeriac and mash them with the sauce so it becomes a bit thicker. Add more salt to it if needed and serve with the meat. Serve a good portion of roasted vegetables and 2 or 3 thin slices of meat. For the rest of the week: boil some lentils and in a Tupperware divide the remaining meat and vegetables and complement with one or two tablespoons of boiled lentils and you will have a full size meal, with lots of protein, low in fat and in simple carbs that will keep you up all afternoon. I have been toying lately with sweet recipes trying to find and fine tune healthy alternatives, I blame the weather, which makes me much more receptive to warm hearty dishes and baking than the summer. It is soup and baking season. 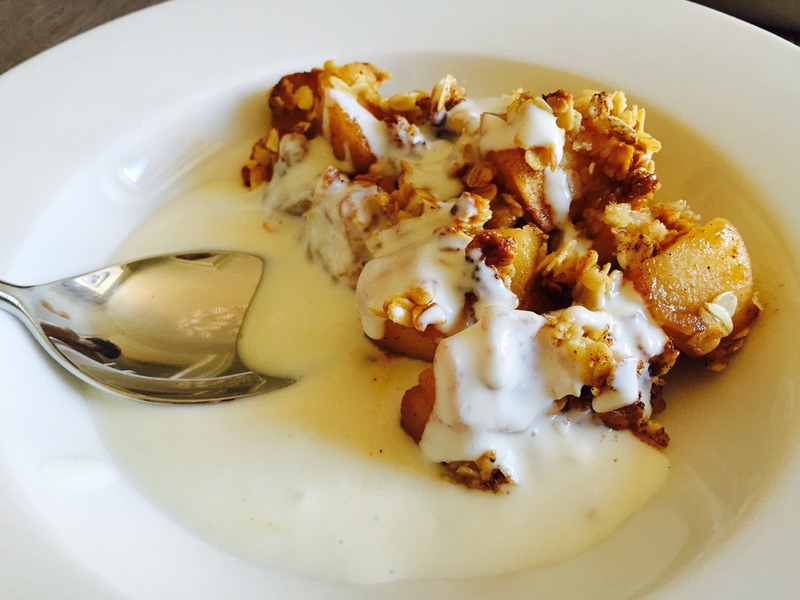 For this recipe, I looked at one of my all time favourites, apple crumble and I tried a lowfat, low carb, low GI alternative to the traditional one, which is loaded with butter and sugar and a white flour crumble. Big task indeed and something had to give, so I kept some butter in the mix. However, I have to say that we don’t actually need nearly as much butter as we normally use. I only used 25 grams of butter for a two portion crumble which turns out to be very little when divided by two. Because of the ingredients used, it is also paleo & gluten free. What else you can ask for? This is obviously a very simple recipe 🙂 Peel and chop the apple (no core or seeds) into 1 cm squares. 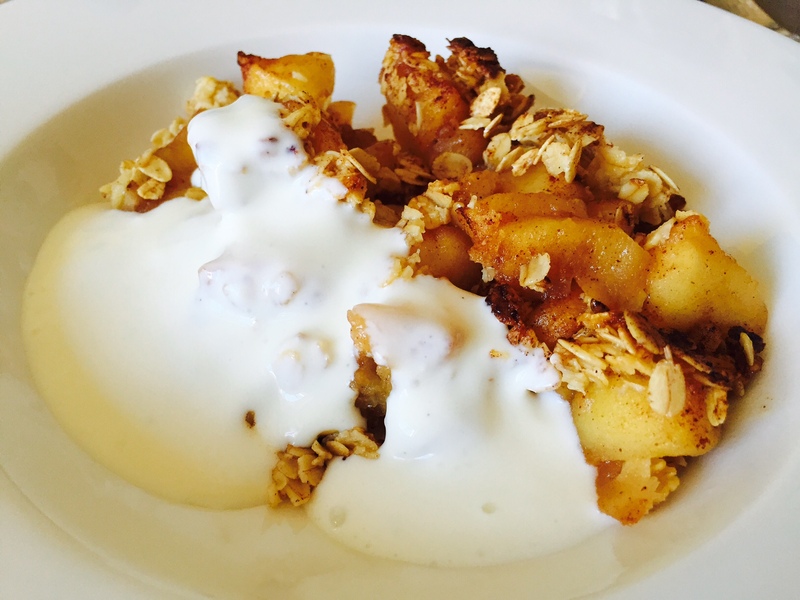 place 10 grams of butter in a pan and heat up, when melted, all the apple, stir in and add 1/2 a tbsp. 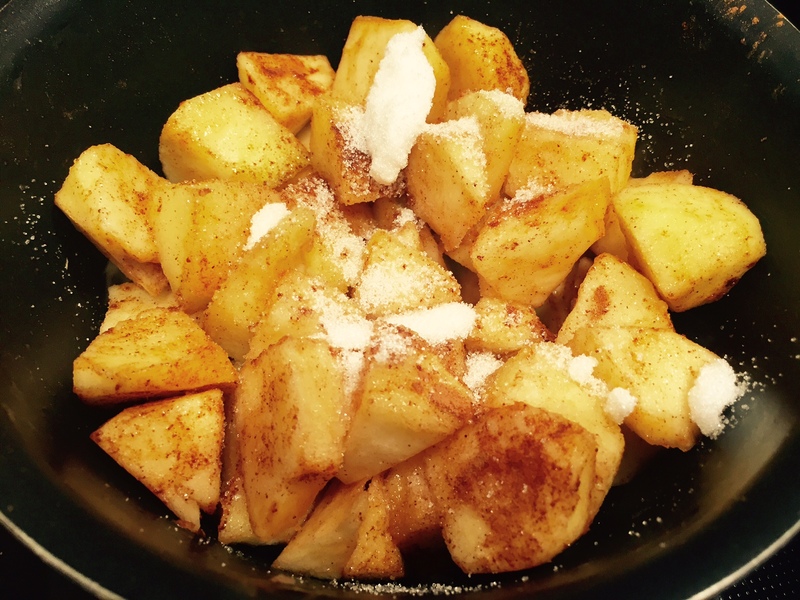 of cinnamon and 1 tbsp. of granulated fructose. Let it cook over medium heat for 5 minutes. 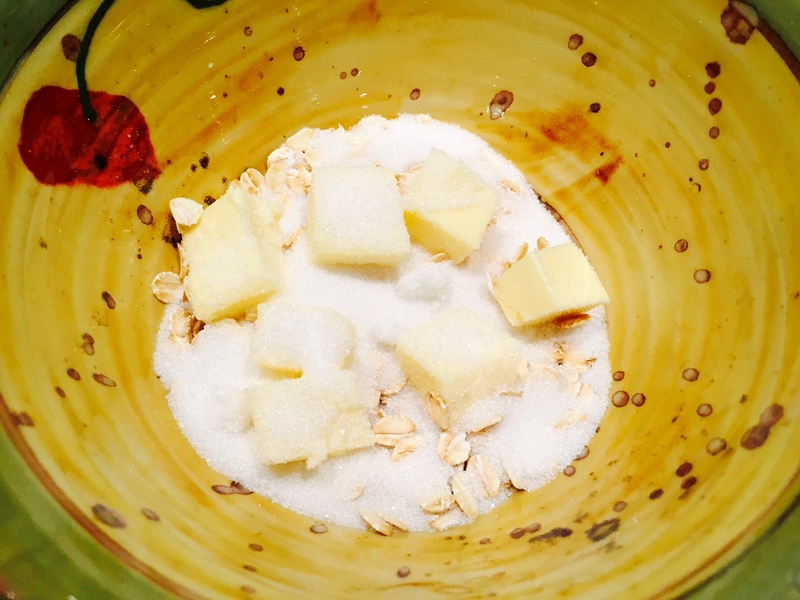 In a bowl, mix the oat bran or oats with the rest of the granulated fructose and the rest of the butter with your fingers until you have a crumbly (Dr. Obvious) mixture. Fructose is a natural occurring sugar from fruits and has the advantage of having a lower glycemic index than regular sugar. It still has a significant calorie content and it’s high in carbohydrate, so it is meant to be consumed occasionally. 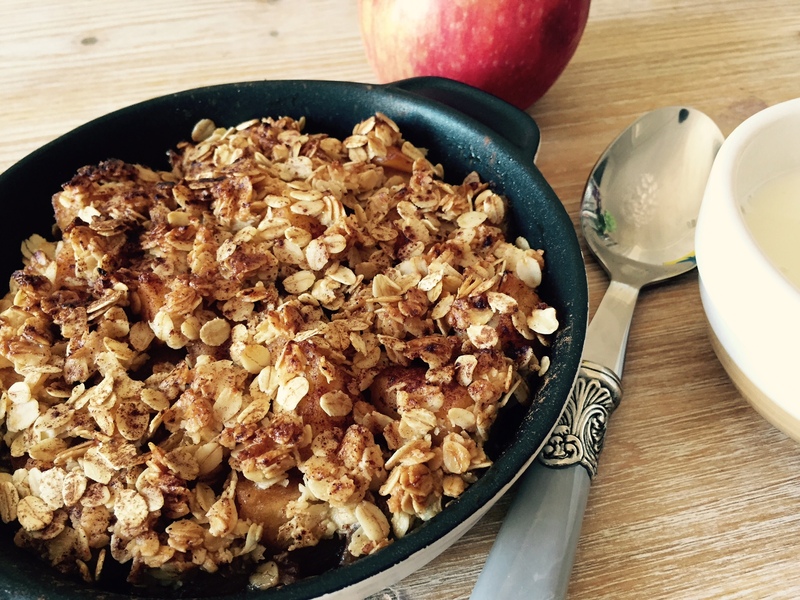 Once your apples have made your house smell like a bakery and they are nice and gooey, place them in an oven proof container and spread the crumble on top. To finish it off, bake for 15 to 20 minutes in the oven and serve with the 0% fat cream alternative (which is a simple mix of all the mentioned ingredients).